Working with Windows is not always easy. Windows has it’s quirks. One of them is that sometimes some server will show up in management consoles in Uppercase, and others in lowercase. 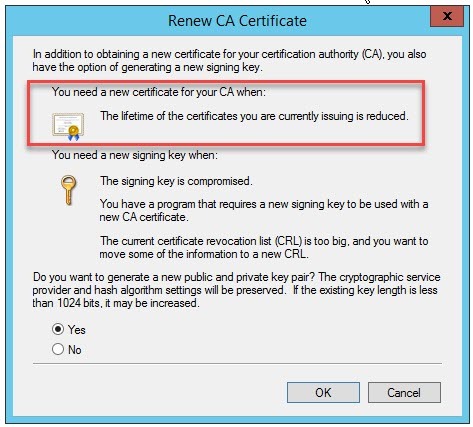 Microsoft keeps saying that Windows will recognize both Uppercase only hostname and Lowercase hostname without differentiation. Windows DNS is case agnostic. But Unix/Linux DNS is case sensitive. Unfortunately, I’m a perfectionist, and use Unix/Linux on a regular basis, so I really like all my hostnames to be in lowercase. A few years past, I did try to rename hosts, remove them from Active Directory, and add them to try to change them from Uppercase to lowercase. Only recently, have I found the way to make and enforce these changes without messing account with the system and renaming process. 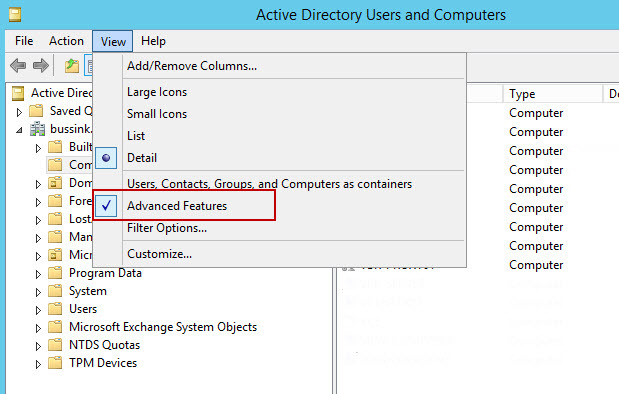 The answer is simple, you just need to head to a domain controller, start the management tool “Active Directory Users and Computer” and enable the Advanced Features under the View tab. And we head to the Attribute Editor. 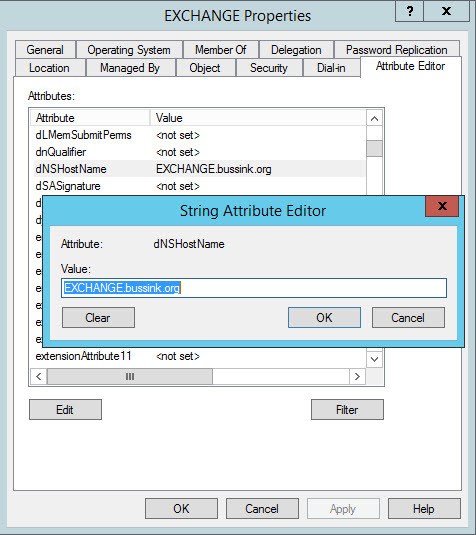 In the Attribute Editor, you scroll down the dNSHostName attribute, and you edit it. Well there… that hostname is all in Uppercase. Now here you have to be careful in not messing up, but you can edit it and change it to lowercase, and apply the change. You need to find the proper time to restart your server. 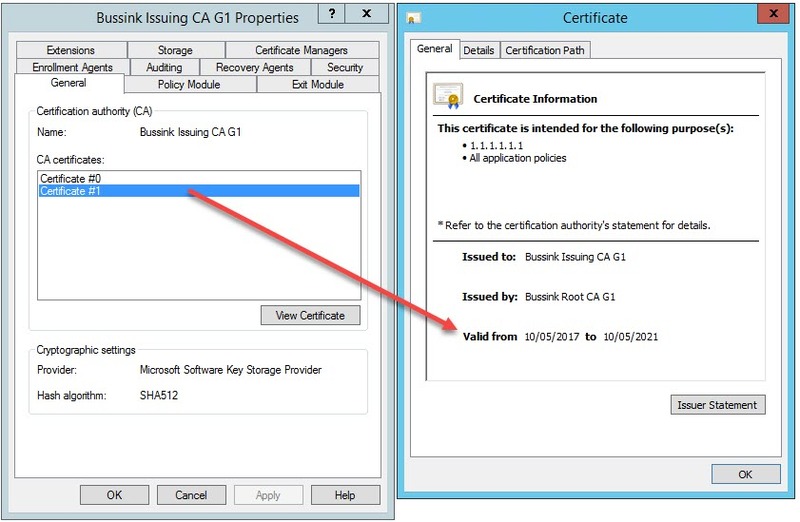 And now your host will show up in the Active Directory in lowercase. I’m a big beliver of Defense in Depth, when it concerns to Information Technology Security. As such I always leave the default Windows Firewall activated, in my configs. Every so often I install a SQL Server, and I need to open the port. 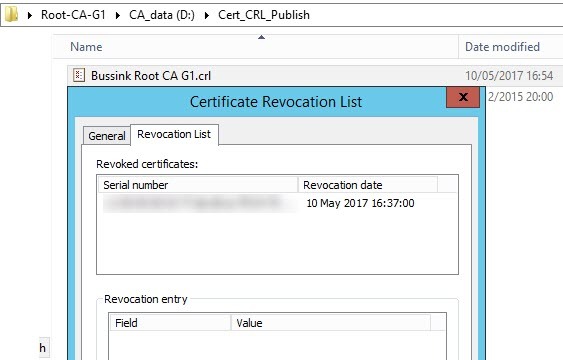 It’s not just opening a 1433/TCP port from everywhere, but more to add just the right rule to allow Domain computers and LocalSubnet machines to talk to the SQL Server. The following command will do it. 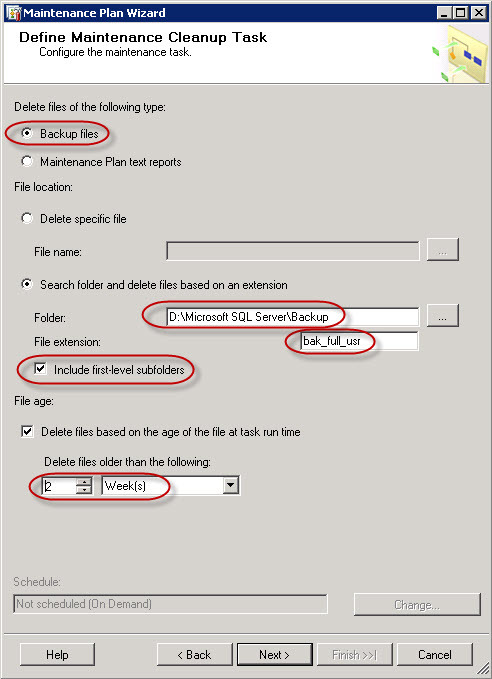 The second small entry for myself, is SQLServerManager11.msc to call up the SQL Configuration Manager of a SQL Server 2012 when the icon is missing from the Desktop or Start Menu. I’ve written this small entry, more for myself, so I can find it back again quickly. When you use Microsoft SQL Server on a regular basis with Transact-SQL scripts, it is a sometimes useful to quickly find the proper line of code. 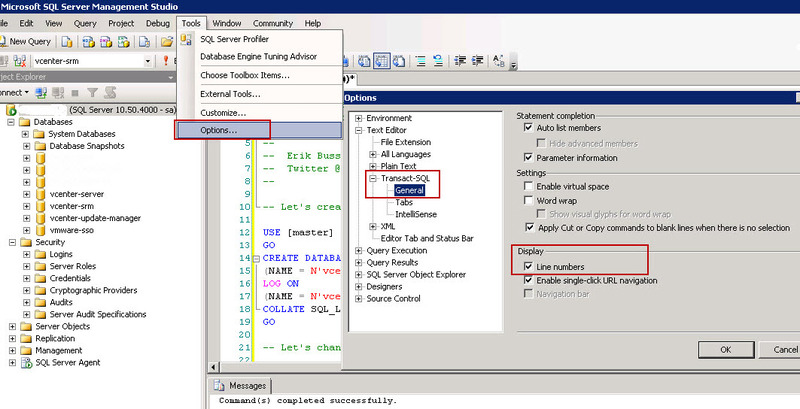 This is a quick tip on how to activate the Line Numbering when working with Transact-SQL. 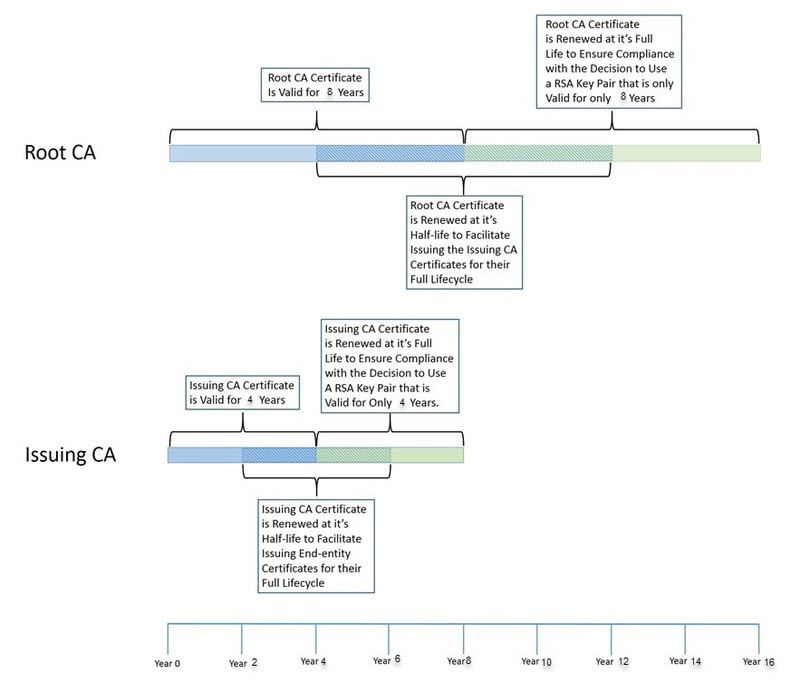 I use Visio a lot to create diagrams for my customers and colleagues. But when I tried to import Cisco Stencils I retrieved from the Cisco website, or HP Proliant Stencils from VisioCafe with the Visio 2013 RTM, you get the following error message. So think hard before upgrading to Visio 2013 if you need to use Stencils. Thanks to Maxm and his reply I found the problem. The trick is to untick the boxes to be able to open Stencils. Seems backwards to me, but that’s Microsoft for you. Yesterday, while upgrading a new vCenter virtual machine that was created on an ESX 3.5 host, to a new ESXi 5.0 host, we found ourself with a VM that was refusing to start any services. and the whole suite of vCenter services (vum, syslog, dump, web service). The virtual machine was created on an ESX 3.5 (Build 604481) and was configured as a VM Version 4. The target platform was a new ESXi 5.0 Update 1 host (Build 623860). So we cold migrated the vCenter to the new system, via a shared VMFS3 datastore. At this point, the virtual machine was running fine as a VM Version 4 on the ESXi 5.0 Update 1. I then started the upgrade process, with the installation of the VMware Tools, to ensure I had all the proper drivers in the VM. I then powered off the virtual machine, and upgraded the hardware to VM Version 8. The system restarted but there was an issue with the various services. I could not open the network settings, I could not uninstall the VMware Tools as the Windows Installer service was not running. My data and database log disks where not visible, I could not open the disk management control panel. The following two paragraphs are taken from the Microsoft Support Article. I’ve create numerous virtual machines named DC1, as I’m trying to use the Microsoft Windows Server “8” Beta Base Configuration Test Lab Guide (TLG) that is located at http://go.microsoft.com/fwlink/p/?LinkId=236358. I have used these VMs with the VMware Tools from the TechPreview, without the VMware Tools, and with a Custom implementation without the SVGA graphic drivers. I’ve attemped my test on both the Windows Server 8 Beta with GUI and in Server Core. I installed Workstation Technology Preview 2012 on two different computers and re-downloaded the en_windows_server_8_beta_x64_dvd_810648.iso from Microsoft twice. 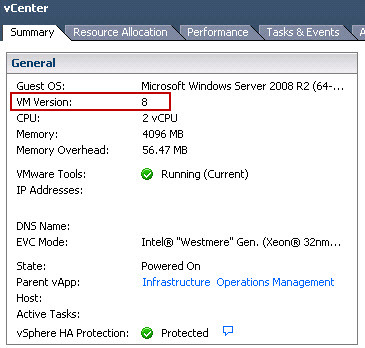 I just can proceed with using the Workstation Technology Preview 2012 to test Windows Server 8 Domain controllers. I made a small video of the process, which is appended to this article. Here I’m trying to install the Active Directory Domain Services on a Windows Server 8 Beta running inside the VMware Workstation 2012 Tech Preview. 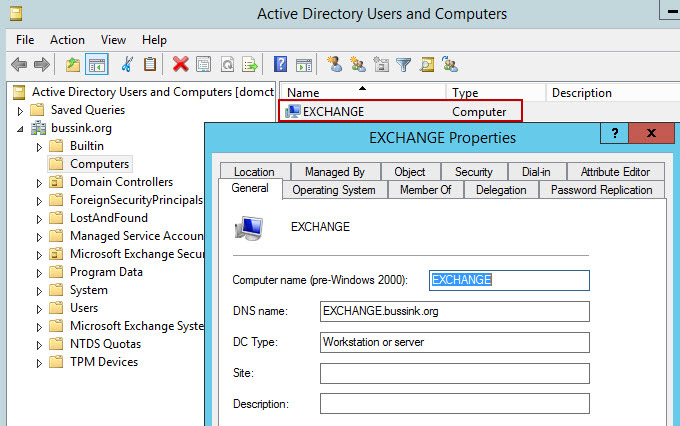 The install of the AD-DS and DNS service work fine, but when the domain controller reboots, there is no GUI left. 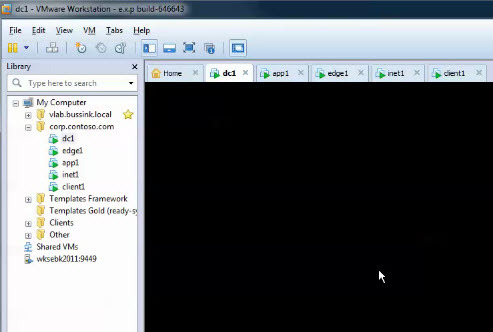 In this VM the VMware Tools where not installed. 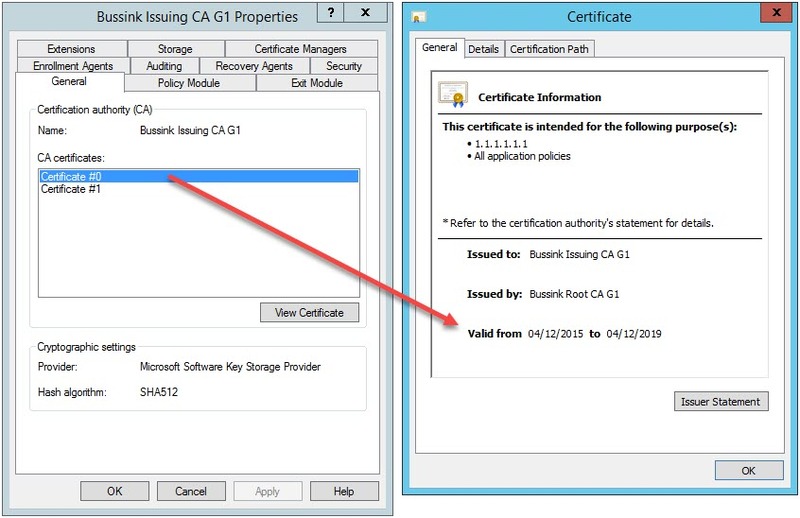 Once the newly promoted domain controller reboots, the GUI does not come back, and the IP addresse cannot be pinged anymore. 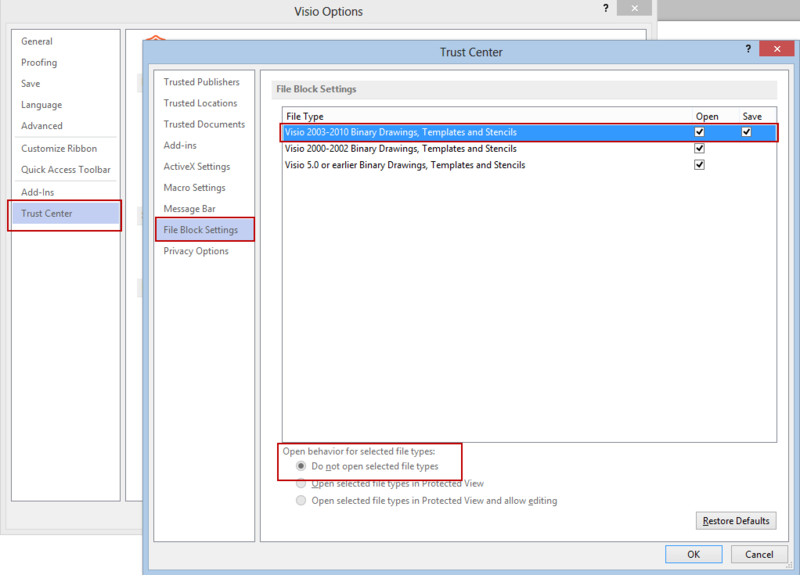 Update: Well in VMware Workstation 2012 Tech Preview, if you select the a Windows 7 version or Windows Server 2008 version instead of the Windows 8 setting, your V will NOT go black screen on the dcpromo. I shall start by saying that I’m by no way a Database Administrator, but over the years I have picked up some knowledge and I have talked to a few guys that have more Knowledge on the topic to learn small tips & tricks. I have created in previous posts how to quickly create a vCenter Database using Transact-SQL scripts, and how to create a vCloud Director database using Transact-SQL script. 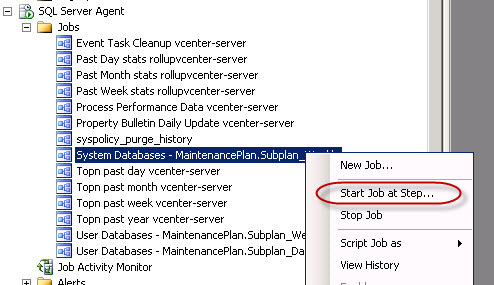 It this small article, I will just resume how to create some Maintenance Plans to ensure that your vCenter/UpdateManager/vCloudDirector databases are backed up. 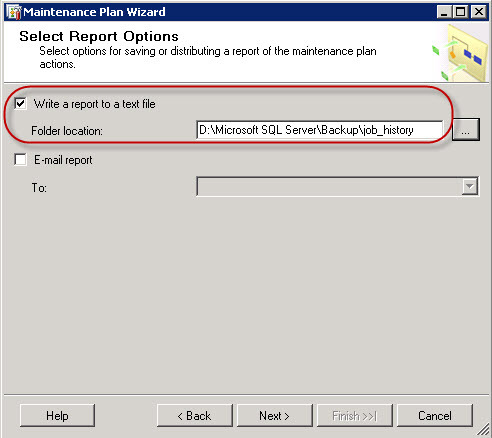 I’m not using the Full Recovery model in SQL Server 2008 R2 for my lab and my clients, so these maintenance jobs should be fine. I believe that if you have a large enough environment that is critical to your day-to-day operations, you should use the Full Recovery model, but you would then also have a real Database Administrator onsite that could manage, nurture and keep your databases in proper running condition. I have seem my share of transaction log databases for VMware vCenter go haywire, such that the Roll-Up jobs are not running anymore (Check your History Log) and the transaction log databases explodes. My personal worse situation was last year at a client that didn’t check their database and the transaction log database run out of storage on the disk when it passed the 90GB. There are procedures on the VMware Knowledge Base on how to compact and roll-up these huge transaction database, but it takes a lot of time. In most cases, we cut out losses and just purge the transactions logs. Coming back to my Maintenance plan. 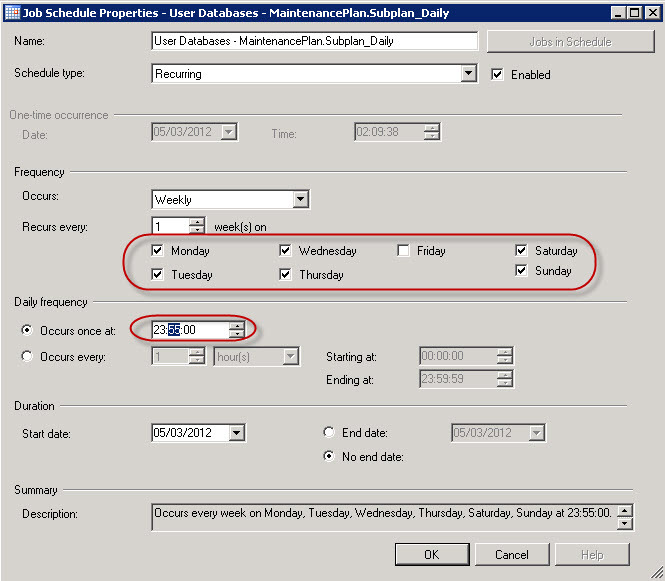 We will create to sets of database maintenance plans, one for the System Dababases and one for the User databases. I need to thank my friend Eric Krejci for showing me how to separate the two maintenance plans. 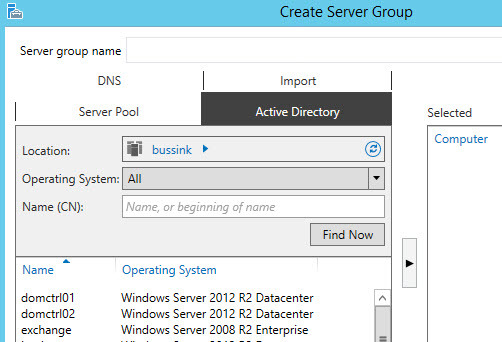 We need to connect to our database server using the SQL Server Management Studio program. And from the Management folder, select the Maintenance Plan and start the Wizard. 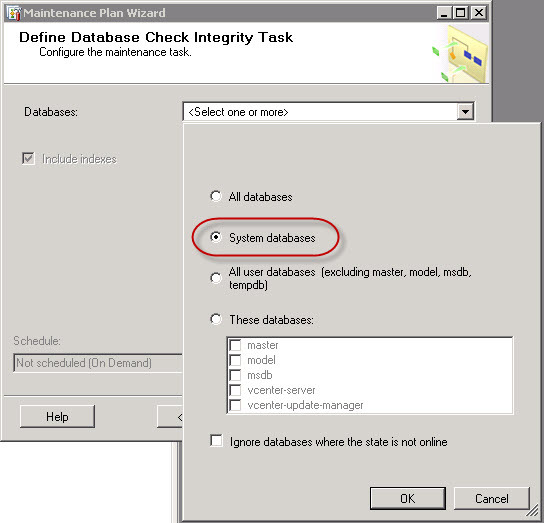 The System databases is comprised of the Master, Model, MSDB and TempDB databases. 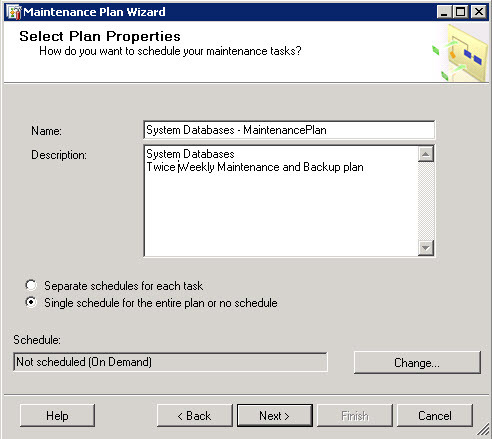 These database don’t change much, but I will select to make a Twice Weekly maintenance and Backup Plan. 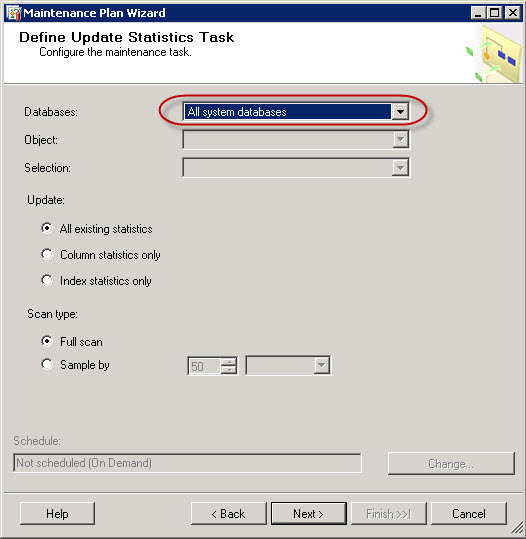 Please note that the MSDB database contains all the Stored Procedures for your vCenter & Update Manager database. And let’s Schedule the Plan for two runs per week on Tuesday evening and Friday evening. You can select any other pattern that you wish.I for one also use VMware Data Recovery 2.0 for making daily backup of my virtual machines, so I make sure that my VMware Data Recovery schedule does not run on my databases between 23:00 and 01:00. Now we can select the various Maintenance Tasks we want to run. And I have changed their Order around on Select Maintenance Task Order step. 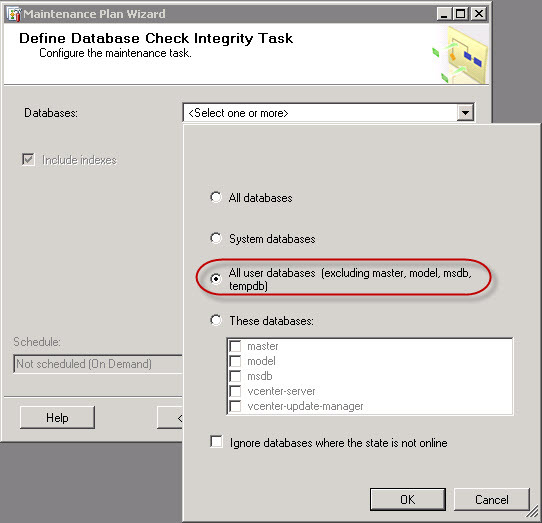 Now let’s configure the Maintenance Tasks – Define Check Database Integrity. 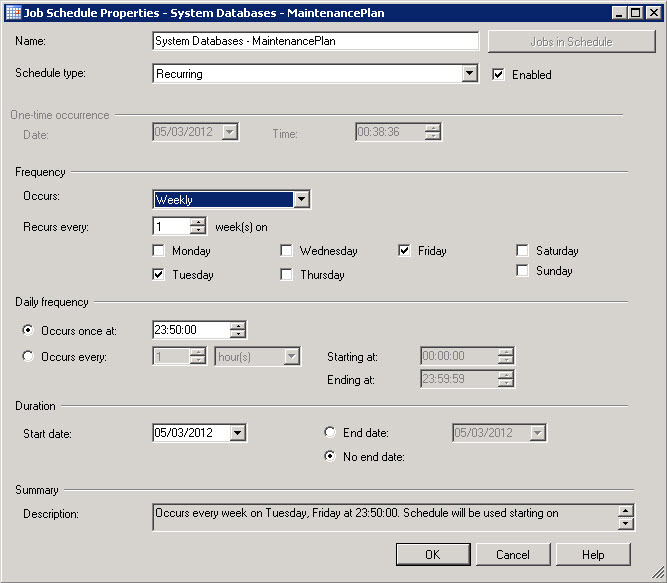 I have selected for this first Maintenance Plan the System Databases. The next step is the definition of the back up job. 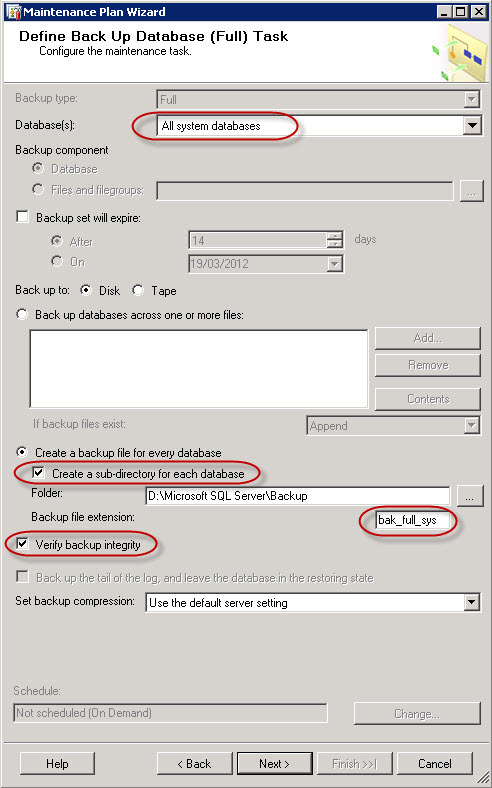 Define Back Up Database (Full) Task. Please note that we have added the option to create a sub-directory for each database, and to verify the backup integrity. 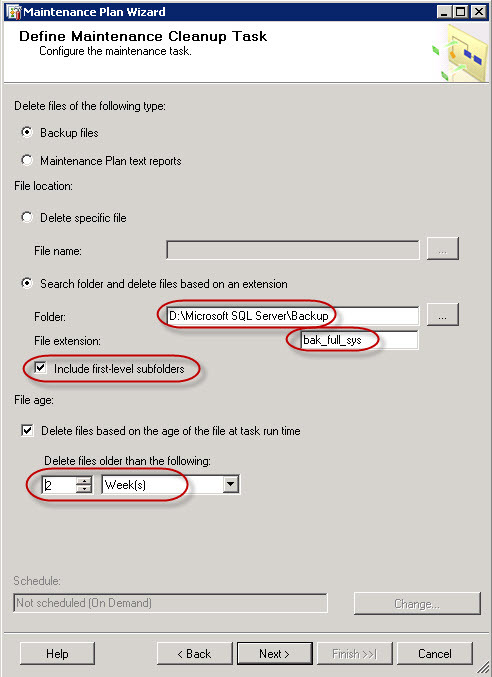 I have also modified the Backup File Extention to BAK_FULL_SYS so that we can make better use and more flexible backup cleanup maintenance job later in this article. 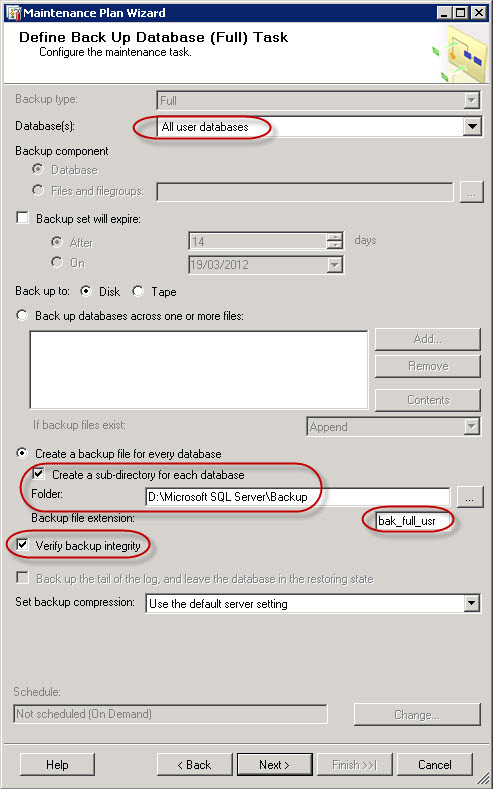 There is always a good discussion if you have enough Compute power to create a compressed backup or not. Now that we have a good full backup for the system databases we can do some database shrinkage. Define Shrink Database Task. Update 22/03/2013. 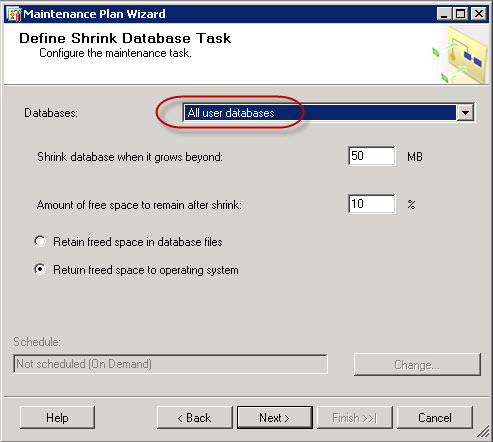 Since I created this post, I’ve stopped using the Shrink task in the maintenance plan. I rather do it sparingly manually than automate it. Now remember that we modified the Backup File Extension earlier. 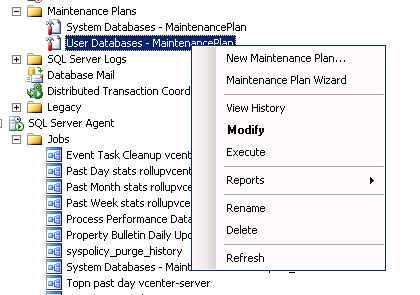 We we will now Define Maintenance Cleanup Task to erase all System Databases backups that are older than two weeks, and we will use the various sub-folders for the backups. 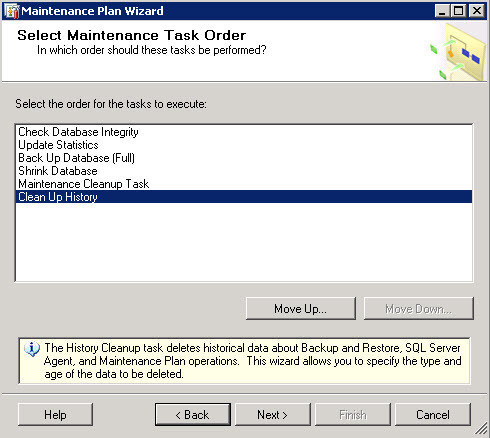 And last we Define History Cleanup Task for the whole SQL Server 2008 R2 instance. I did not modify the settings of this tab. 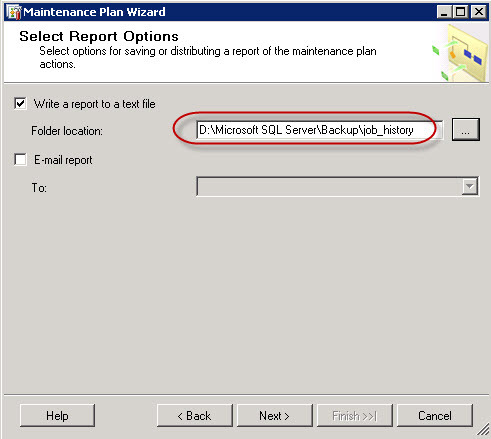 This Maintenance Task will cleanup the Backup and Restory History, the SQL Server Agent job history and the Maintenance Plan History. 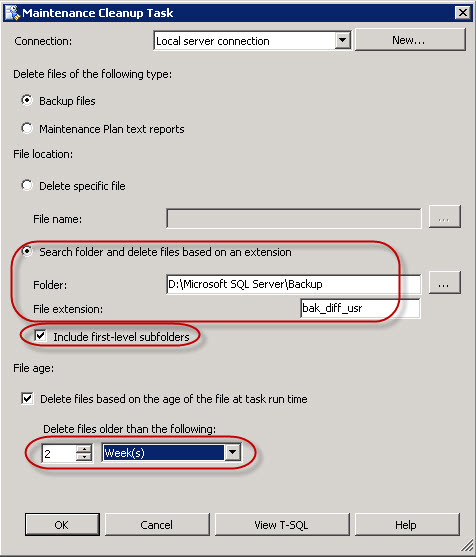 We will also save a copy the Maintenance Plan actions to a text file in the same directory as where the backup files are stored. 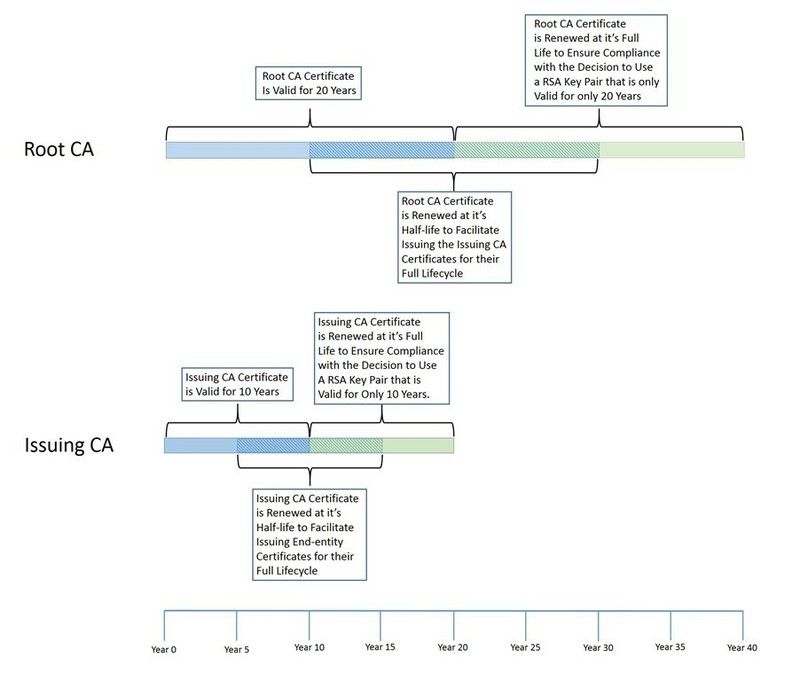 We now have a resume of the Maintenance Plan we can complete. We now attack the User Databases Maintenance Plan. We start our Maintenance Plan Wizard and start the definition of the plan properties. I’m creating a Maintenance Plan for the Users Databases that will create a Differential Back Up every day, and a Full Back Up on Friday. 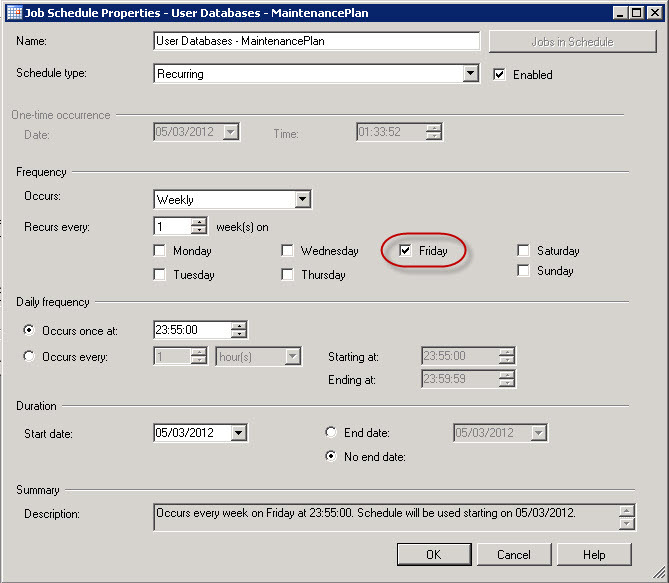 I modify the Schedule so that the main part of this Maintenance Plan including the Full Back Up happens each Friday. I will then later add a subplan to do the Differential plan each day. 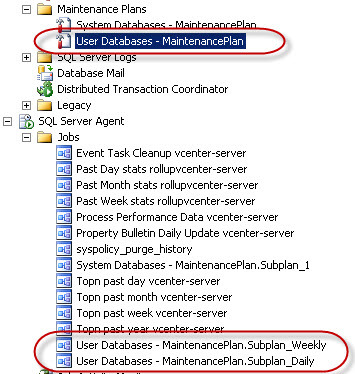 We now add the various Maintenance Tasks for our Users Databases. 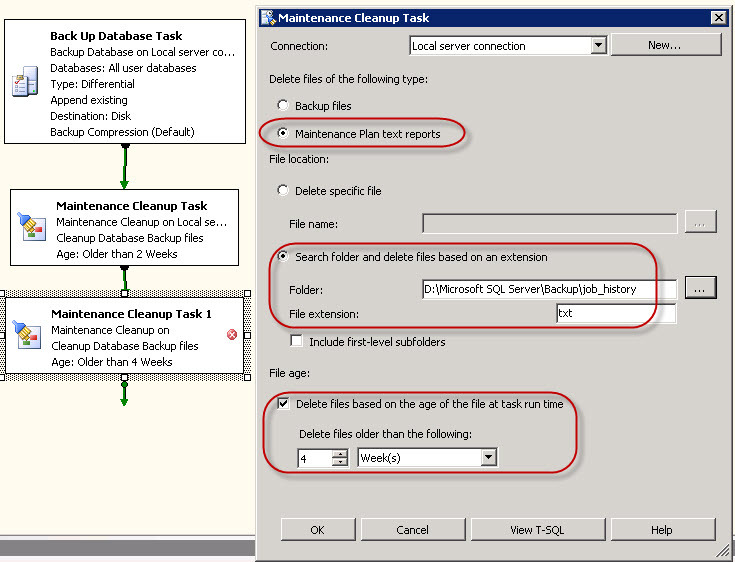 And we Select Maintenance Task Order to move down the Shrink Database task after the Back Up Database (Full). 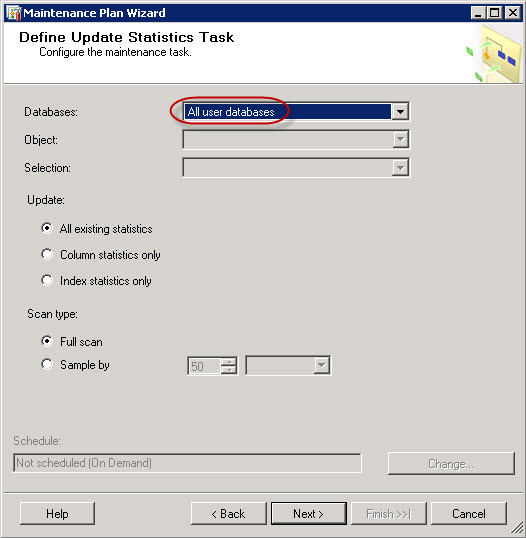 We Define Update Statistics Task for the User Databases. 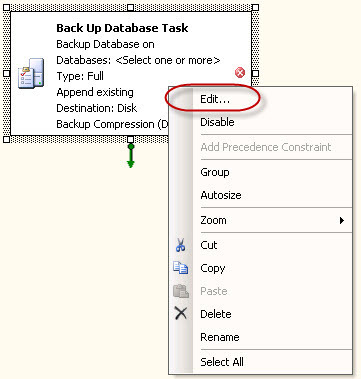 We now do the Back Up Database (Full) Task for the User Databases. 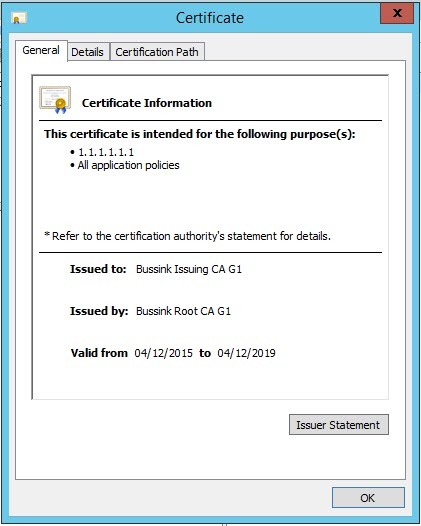 Note that we use sub-directories for each database, we changed teh Backup File extionsion to BAK_FULL_USR and we verify the integrity of the backup. Once we have the Full Back Up of the User Databases we can launch the Shrink Database Task. We now setup the Maintenance Cleanup Task for the User Databases so that we keep only the last two weekly full backups. 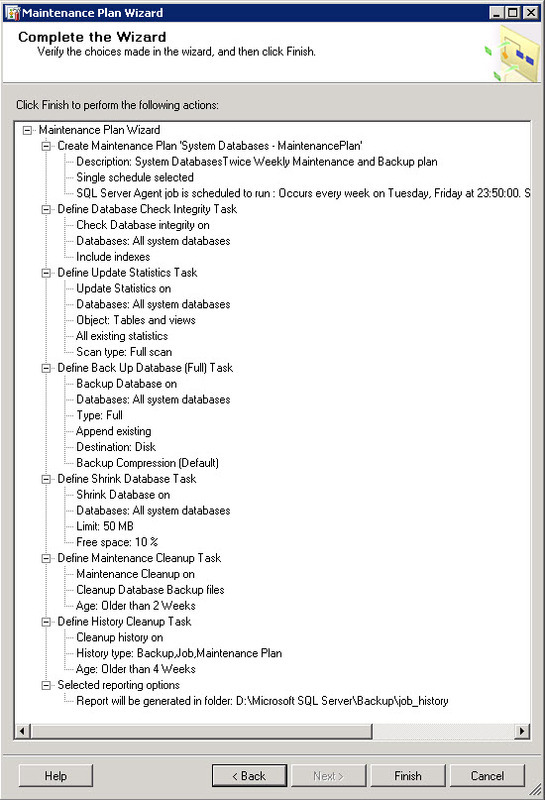 And we save the Maintenance Plan Report to the job_history directory. We now have a complete Maintenace Plan ready. 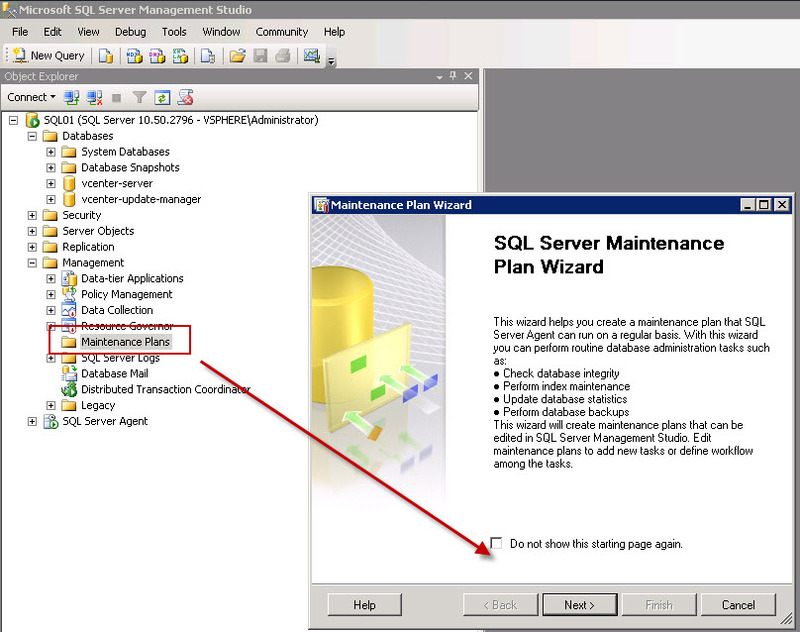 This creates the new Maintenance Plan and the SQL Agent Job. 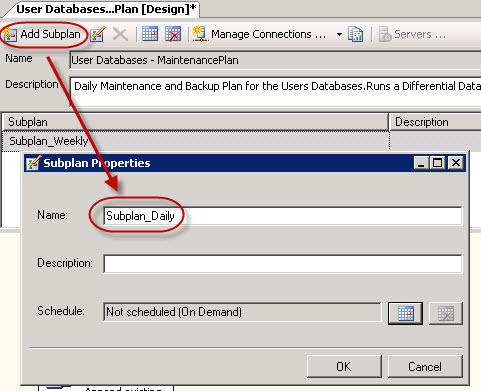 And let’s quickly rename the Subplan_1 to Subplan_Weekly in the Subplan menu. And we edit the Job Schedule to run everyday but Friday at the same time. 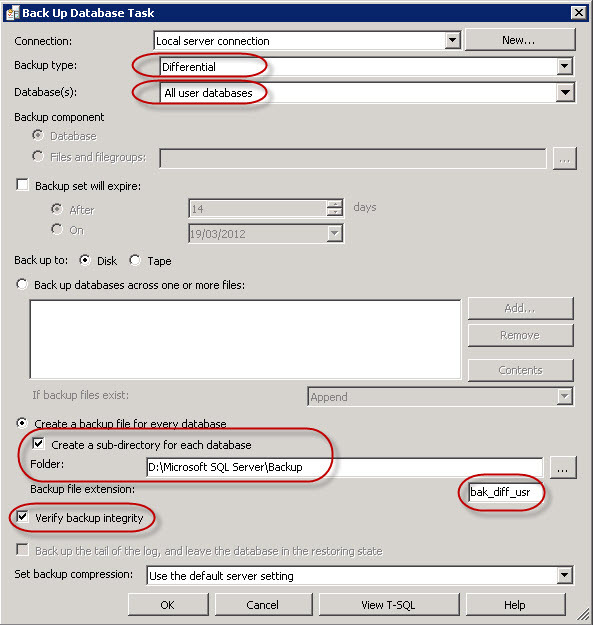 And we modify the Back Up Database Task for Differential Jobs, we also make sure the backups are written in their correct directories, that they are verified, and that the Backup File Extension is BAK_DIFF_USR. 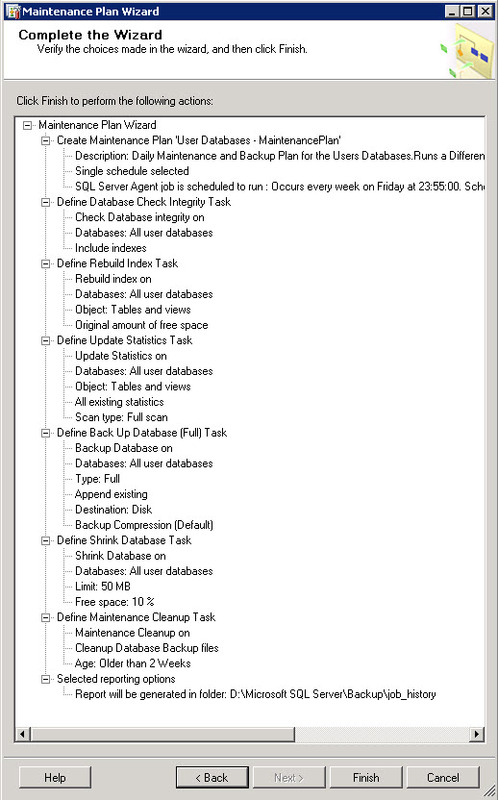 We now add the Maintenance Cleanup Task to this Subplan_Daily job and Linked it to the Back Up Database Task. And we will edit the Maintenance Cleanup Task so that we erase the old BAK_DIFF_USR files. 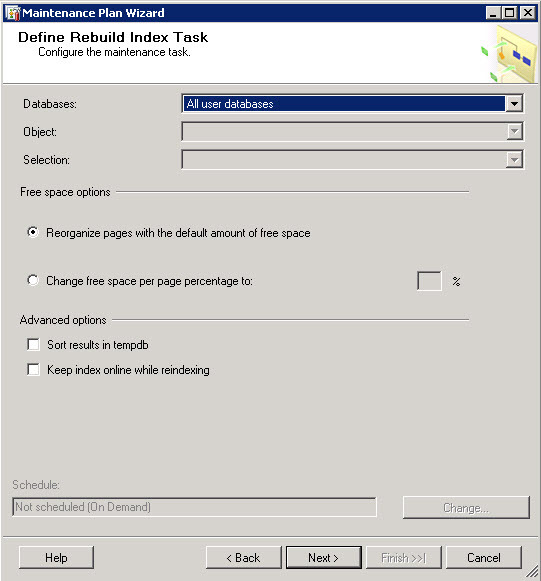 We add a 2nd Maintenance Cleanup Task to clean up the old text reports that are older than 4 weeks. 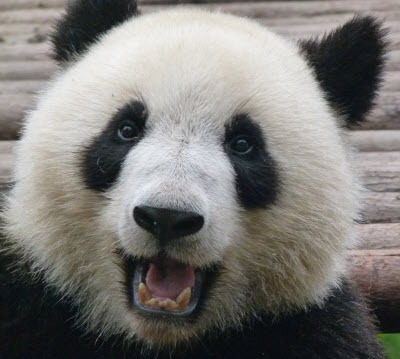 We are now done with the User Databases Maintenance Plan. Do NOT forget to SAVE the Maintenace Plan before quiting it. We now have two specific SQL Server Agent Jobs. 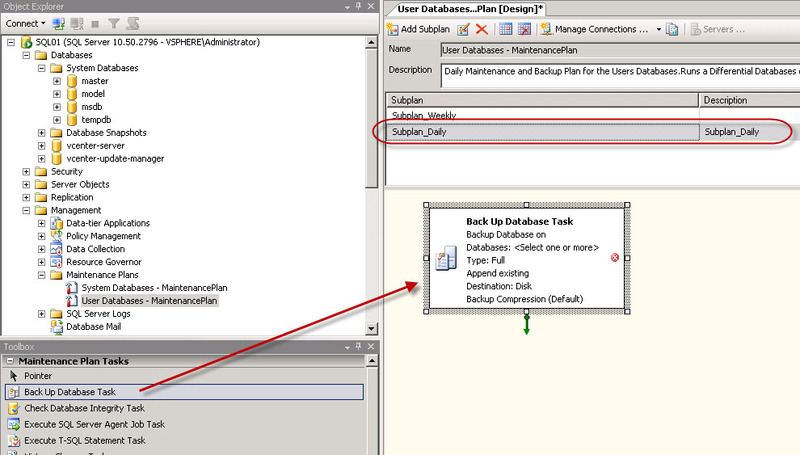 And for the User Databases we will first start the Full Back Up Task, before doing the Differential Back Up Task. When we check the Backup folder we now have a full back of the System Databases and User Databases (Full and Differential). 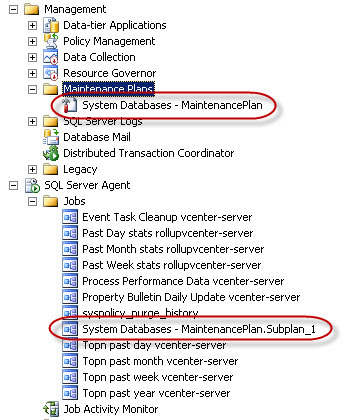 There you are with a Maintenance Plan for the SQL Server 2008 R2 running your vCenter, Update Manager and vCloud Director databases. 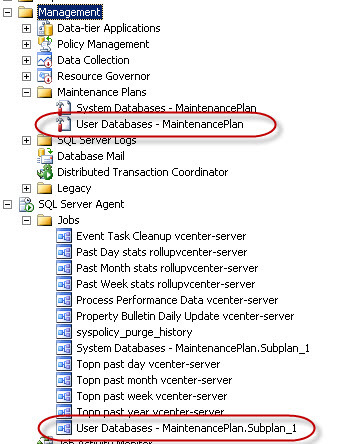 I have to thank once more my friend Eric Krejci as we have discussed this topic extensively a few months ago and he already wrote the same article on vCenter and SQL Backup and Maintenance on his web blog. I’ve purchased last year a Swisscom XPA v1605 (HTC TyTN, HERMES or Qtek 9600) PocketPC Phone. It’s a PocketPC sized phone that supports GSM & UMTS communications. It came with Windows Mobile 5.0 and had a few Service provider installed applications (F-Secure Anti-Virus, TomTom Navigator 5 for Switzerland, SBB Timetable) and the Swisscom Mobile Assistant tools. While the phone looked good, I have not been too happy about the performance of the user interface. Additional programs like the SPB Pocket Plus also gave me lots trouble, and the worse, was the high quanity of missed calls.Swisscom has made available on their support pages an upgrate to Windows Mobile 5.0 AKU 3.3 (Update V2.08.170.1). After having installed the memory card software for the XPA v1605 on a brand new 2GB MicroSD, I upgraded the Swisscom XPA v1605 to the latest firmware version. I added the two excellent versions of SPB Pocket Plus and SPB Diary. The result is a Windows Mobile 5.0 device that feels a lot more snappy at usage, faster loading, using smaller memory footprint and supports the latest Direct Push Technology from Microsoft. Warning: A small note for SPB Backup users, the backup created on the previous version of Windows Mobile 5.0 didn’t load up properly under AKU 3.3, I had to retrieve all my original contacts from an old Outlook contact list.